A wicked fairy disguised as a harmless old lady casts a spell on Sleeping Beauty, causing her to prick her finger on a spinning wheel and fall asleep for 100 years. Snow White eats a poison apple given to her by the evil Queen disguised as a farmers wife, and falls into a deep sleep. Her buddies, the dwarfs, think she is dead and put her in a coffin. 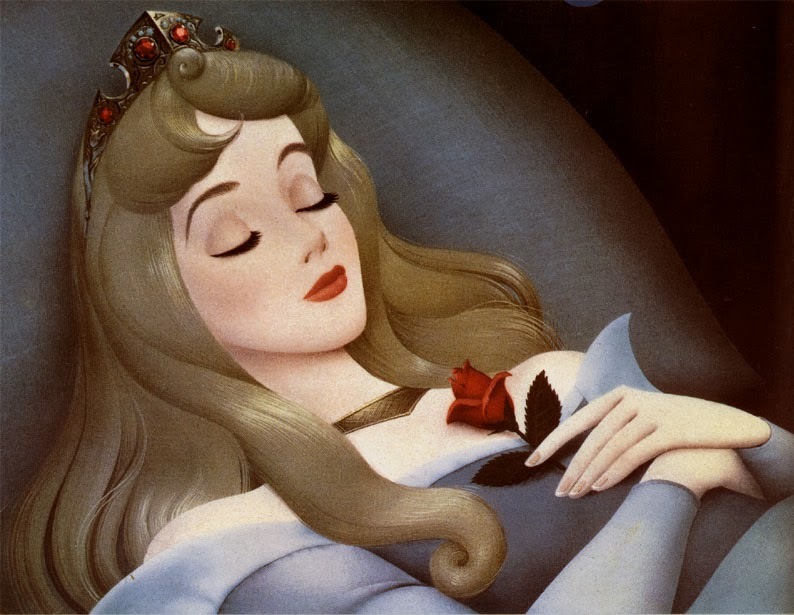 Sleeping Beauty pricks her finger on the poison spinning wheel after months of insomnia. She knows that spinning wheel poison is addictive, but she is frantic to get some zzzzzs. She overdoses and sleeps for 100 years. Snow White meets a farmers wife at the farmers market who tells her that if she would eat more fruits (like apples) and veggies and less sugar she will sleep better. Snow changes her diet, and finally is able to fall asleep. She wakes up after only 3 hours of restless sleep because she had a vivid nightmare about 7 small men putting her in a coffin. A good night's sleep is golden. I can not understand why children protest when it is time to take a nap. Think how incredible it would be if, every afternoon, you went to your dark, quiet room where you climbed into your comfy bed. A nice person read to you, turned on your fan, and backed out of the room, assuring absolutely no interruptions. You could get up to go to the bathroom and get a drink of water, but otherwise the only thing you had to do was sleep. Can you even imagine how wonderful that would be? It doesn't matter how old you are, or what you do for a living, sleep deprivation is horrible. It is a HUGE problem among my readers, so I have spent many hours mining information to find "rest for the weary." I know these nuggets will work to improve your sleep. But in order for them to work, you must be patient and do everything listed. Even if you have used one or two of these nuggets in the past, try again, this time doing everything at the same time. 1. Eliminate any and all light. Your bedroom should be absolutely, totally dark. Not even a sliver of light should be seen anywhere. The clock radio with the glowing digital clock? Get rid of it. Or put a towel over it, thick enough to totally shut out the glow. The windows? Put up room darkening curtains behind your drapes. I have blackout panels that connect to my draperies and have a Velcro closure. They are barely wide enough for my window, so be sure to buy enough panels to cover yours so that no light shows. You can get them at Target, Bed Bath and Beyond, or order them on line from Amazon. For blackout panels from Amazon, CLICK HERE. Any other light source? Do you have a TV in your bedroom with any lights? Is there light coming from under your door? Night light in the bathroom? What about your smoke alarms? I had to put several pieces of electrical tape over the smoke alarm light in order to keep it from glowing. Sounds excessive, but if you want it to work, you must be vigilant. 2. Turn down the temperature. This woman is obviously having trouble sleeping because it is too hot in her bedroom. The biological reason for this is simple. When you fall asleep, your body temperature falls sharply. When it is time to wake up, your body wakes you up by raising your temperature back to normal. If your body can't get cool, it thinks you should be awake. If your feet are cold, wear socks. Cold feet will keep you from falling asleep. If you have a foam pillow or pad on your bed, consider replacing them if you can't get cool. Foam is hot. Replace polyester with cotton. 3. Wear ear plugs to bed. Some people have a problem with this one for some reason. People complain that they can "hear themselves breathing," or that they just don't like the thought of something in their ears. If you want to take yourself back to the comfort and serenity of the womb, you will force yourself to use ear plugs. The sound of your own breath will become very soothing to you. You will psychologically prepare yourself for sleeping when sounds are muffled. You can still hear if a child cries, or if the phone rings, but you will not hear little house creaks, rain on the roof, or traffic. 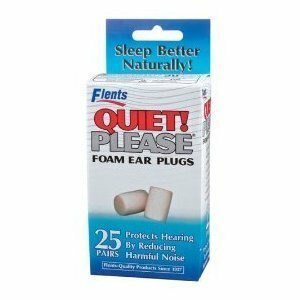 My favorite ear plugs are foam that you squeeze and they open slowly in your ear. I like the kind that are shaped like a barrel rather than like a bullet. They are called Flents Quiet! Please ear plugs. You can get them for about $3-$4 for 25. To order from Amazon, Click Here. It is amazing to me how many people will take a highly addictive prescription sleeping pill from their doctor, but are afraid to try melatonin. Wake up, people! (poor choice of words, but you know what I'm saying.) Melatonin is a hormone in your body that regulates your sleep. You make less of it as you age, thus the reason many old people have insomnia. Melatonin is also found in some foods. You can buy it at any drugstore. It takes some patience to find the right dosage of melatonin to be effective for you. But it is worth it. Start with 3mgs. Take it for a few days, 1 hour-30 minutes before bed. If you don''t notice any difference, go up to 5mgs. If you have restless sleep with vivid dreams, and/or wake up groggy, cut back until you find the right dosage for you. If you fall asleep quickly with the melatonin, but you wake up wide awake in the middle of the night, try a time released melatonin. I wish someone had told me all of this when I tried melatonin a few years ago. It gave me crazy dreams and made me feel awful in the morning, so I immediately quit using it. If someone had told me to be patient and work on getting the right dosage, it could have saved me many sleepless nights. I take whatever brand I can find in the drugstore, but my preference is Natrol. Natrol makes melatonin in 1mg, 3mgs, and 5mgs and time-released in each. It's really inexpensive, about $5 for 60. For ordering and reviews on Amazon.com, Click Here. So, to recap: Every night take the correct dosage of melatonin. Make sure your bedroom is very cold and very dark. Put in your ear plugs, and I promise you will sleep at least eight hours every night. Annie - I love these nuggets! I MUST get the blackout curtains, living in the city there is so much light in my room. Also, having spent a lot of time at Ellen's this summer, I know she has adopted some of these sleep ideas - Thanks! Keep em coming!